A ‘community school’ consists of at least one primary school in combination with facilities. 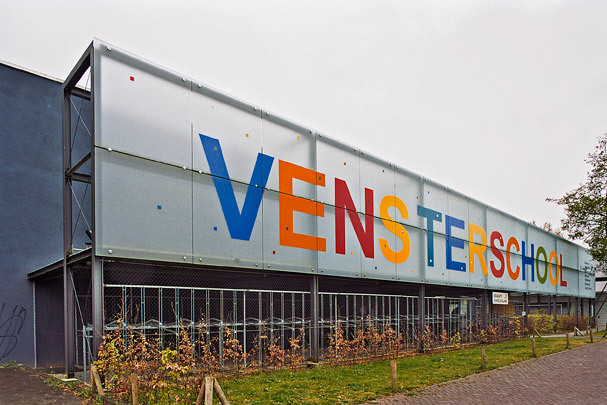 In Groningen this concept, which seeks to mesh together learning and leisure activities to give children a more secure future, is known as a Vensterschool (venster means window). This one, serving the Groningen districts of Selwerd, Paddepoel and Tuinwijk, is hitched to an existing swimming pool and sports hall and adds a library to the primary school and crèche. The new elements are housed in box-shaped volumes together resembling a small village, the whole being tied together by a roofed central ‘square’ (Vensterplein). A tall glass screen acts as a billboard advertising the complex.